Macau embodies the finest of both East and West. A former Portuguese colony, it is no wonder that tourist attractions include historical catholic churches like St Joseph's Seminary and Church, St Lawrenceโ€�s Church and the famous ruins of St Paulโ€�s cathedral. Its stone facade epitomizes the integration of Asian and western architectural styles. A-Ma Temple (from which Macau derived its name), Kun Iam Temple, and Lin Fung Temple are the three most famous Chinese temples in terms of age and importance. Savour classic Macanese dishes, a melting pot of southern Chinese and Portuguese cuisines, like African Chicken, Galinha ร Portuguesa, curried crabs and the popular Portuguese egg tarts. Macau is also home to popular casinos like Wynn Macau, Casino Lisboa, Sands Macao and the newly opened The Venetian Macao and MGM Grand Macau, drawing numerous visitors to try their luck. Book your hotel in Macau today and Good Luck! The Guia hotel is located 8 minutes drive from the ferry and 30 minutes from the airport. It's named Guia hill which is quiet and peaceful surroundings. During the annual Macau Grand Prix, it offers a close up view over the Guia Circuit. The Casa Real strategically situated in the heart of Macau with 5 minutes walking distance to the Ferry terminal and 10 minutes drive to the Macau International Airport. The hotel Beverly Plaza is located at the heart of Macau -Avenida do Dr. Rodrigo Rodrigues which is 10 minutes drive from the ferry pier. 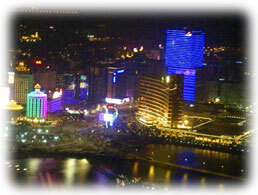 The Golden Dragon is located in the heart of Macau. It is just 5 minutes walking distance to the Ferry terminal and 10 minutes drive to the Macau International Airport. Presidente Hotel is located downtown Macau within walking distance to the Sands & Lisboa Casino, business and shopping centres. The Grand Waldo hotel is located within Taipa. Macau city and Macau International Airport is just five minutes away. The Venetian is also nearby. The Grand Emperor is located in the heart of the finest entertainment and commercial district. 10 minutes from the ferry terminal and 15 minutes to Macau International Airport. The hotel Lisboa is located in the central business district, on Pearl River Estuary, just 5 minutes ride from the ferry terminal and 15 minutes ride from the International Airport. The hotel Landmark is located just 5 minutes drive from the Hong Kong-Macau Ferry Terminal, 15 minutes from the Macau Convention and Exhibition Centre and 20 minutes from the Macau International Airport. The hotel Mandarin Oriental is located on the outer harbour with waterfront views, close to the main commercial, shopping and entertainment district, within walking distance from the ferry terminal and 10 minutes from the international airport. The Sands casino is faced opposite to the hotel.